The ongoing saga that is our campaign to reduce the speed on Miami’s busiest pedestrian street, Brickell Avenue, brought us to a Public Meeting hosted by FDOT last night. I wrote about its implication for bicyclists and everyone else on TransitMiami.com; read the post here. In sum, here is what we are doing at the Coalition to respond as of this afternoon. 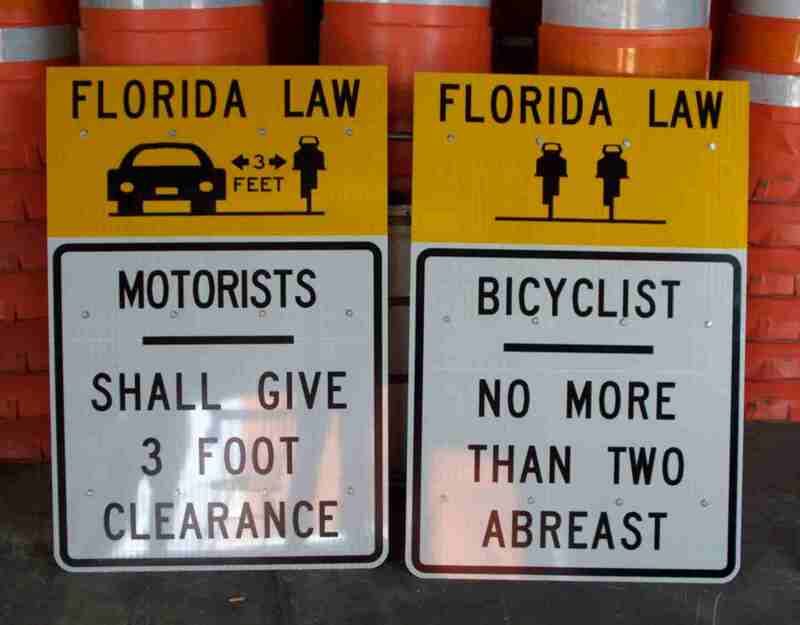 SHARE THE ROAD: We continue to ask FDOT to add installation of Ride Right/Drive Right signs to their project. In addition, we think they should put temporary ‘Share the Road’ signs up on street barricades, too. We put in a formal request and will keep you updated. MEDIA: We’ve spoken to The Miami Herald and hope to see coverage soon. SPEED LIMIT: It will be reduced to 25MPH for the duration of the project. Our coalition of partners asking to reduce it permanently to 25MPH includes such diverse parties as Mayor Regalado, the Brickell Area Association and the University of Miami BikeSafe Program representative (also a Brickell resident). Shared Use Lane Markings/ SHARROWS: We aim to reduce the speed first but this remains a priority. CROSSWALKS: We are thrilled that FDOT is letting the DDA put in more but the FDOT needs to educate themselves on possibly raising these crosswalks so that they are even more effective. We should not have to do this but so we are. Read more here. It seems that as long as Brickell Avenue is known as Highway US-1, there will always be a conflict between those who want a safe, clean street for people who walk, bicycle and/or drive and those who feel compelled to the single rote reply: “We can’t, that’s not up to standard.” I can’t understand why they are so adverse to thinking outside their box, of reaching out to their colleagues within the US for the data they need to support better street design. This is an almost daily party of my job with the Bike Coalition. Still, their mission statement reminds us that You are the Boss of FDOT. Write to them, call them and demand that they stay true to their mission to ”provide a safe transportation system that ensures the mobility of people and goods, enhances economic prosperity and preserves the quality of our environment and communities.” Then write to them and call them again. FDOT is a behemoth, but the people within the system are people, too. And sometimes, even they have to cross the street. For additional questions or if you have comments you would like on the record (support better signs than Share the Road and an effective speed limit! ), please contact Heather Leslie at 305.499.2391 or Heather.Leslie@dot.state.fl.us. BIG SHOUT OUT to all the Bike Coalition members and friends who came out last night. If you weren’t there, please call Heather at the number above and let her know you are just another bicyclist who cares for safety on Brickell Avenue. I'm the President of the South Florida Bike Coalition - a 100% volunteer organization of people dedicated to using their skills and experience to effect more, better bicycling from the Keys to Martin County.